Pablo spent a few weeks at the spa and my does that boat look pretty! 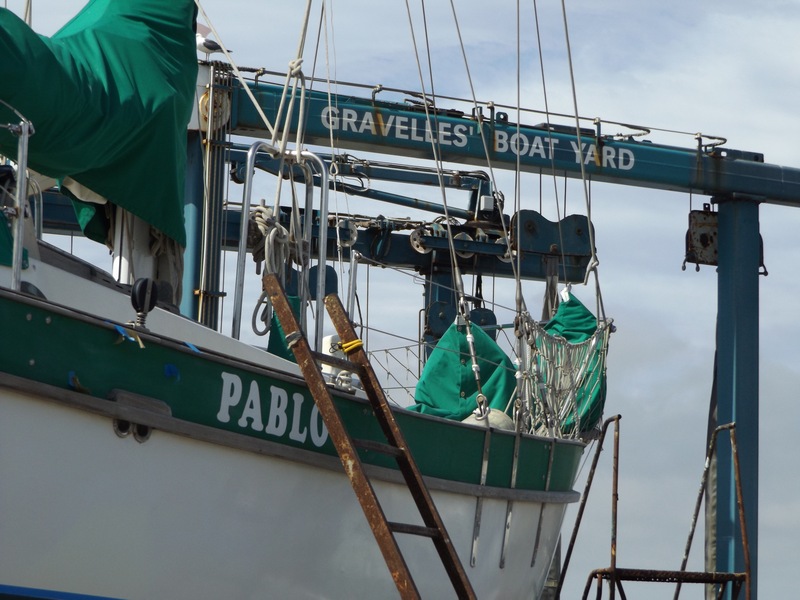 We splashed back into the water after two long and dirty weeks at Gravelles’ Boat Yard in Moss Landing. I cannot say enough good things about the folks that work in the yard. It has recently changed hands and is being cleaned up, updated, and improved in every possible way. Andrew runs the place, sharing his vast knowledge and experience. You see him all day going from boat to boat lending a hand and giving advice. He is kind, fair and easy to work with. Tall Paul the painter, who apparently has been there for years, is now a contracted employee. Paul is an artist in his field, mixing gel coat tints to match just so. 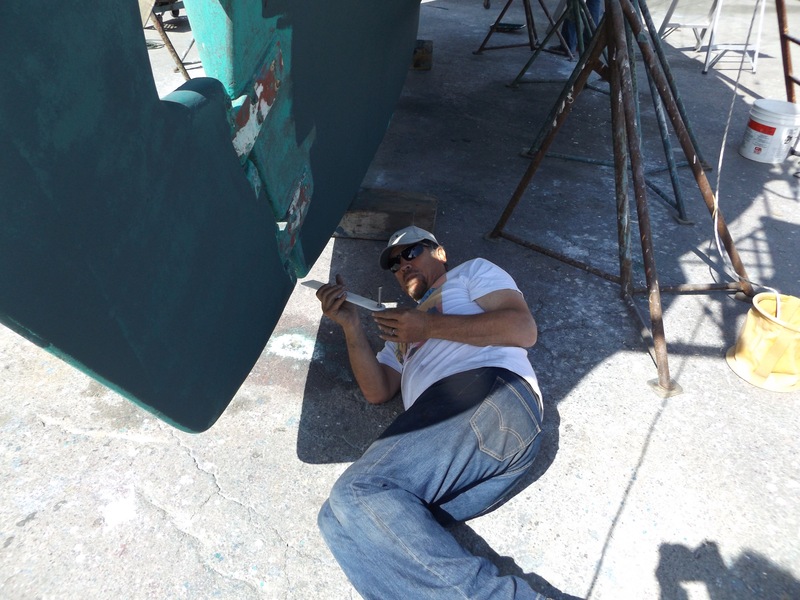 While walking past one afternoon I heard him mumbling to himself as he was working on fixing a bad spot on our hull… “a little more yellow maybe…. no I think a bit more red”. He held a palette in his hand and mixed in various tints until he got just the color he desired. Steve and I were not willing to do an entire paint job on the hull, so we asked that the rough spots be buffed out so she didn’t look so shabby. What we got was a beautifully buffed out gel coat and some paint and repair work that is so perfectly blended I couldn’t find it without knowing exactly where the work was done. While Paul painted the bottom and buffed and beautified the hull, Steve and I got to work on other areas that needed to be addressed. 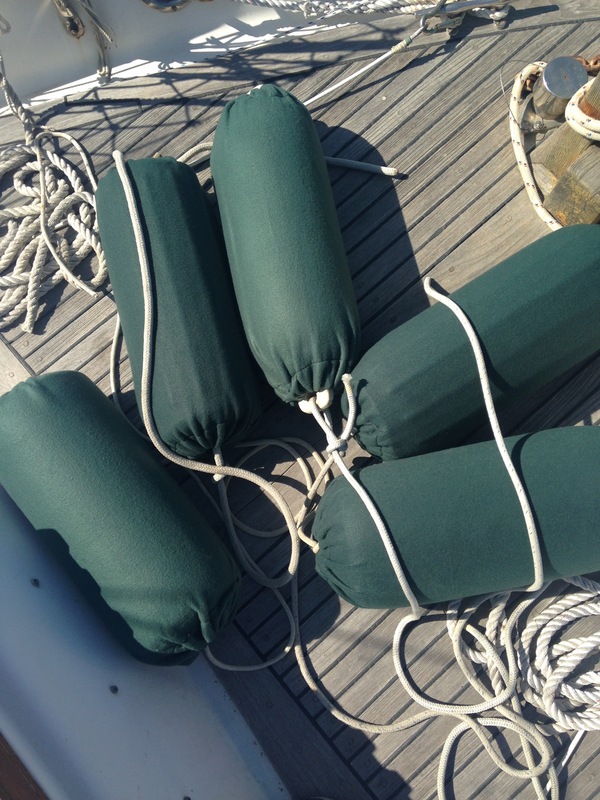 Steve removed and serviced all the seacocks. 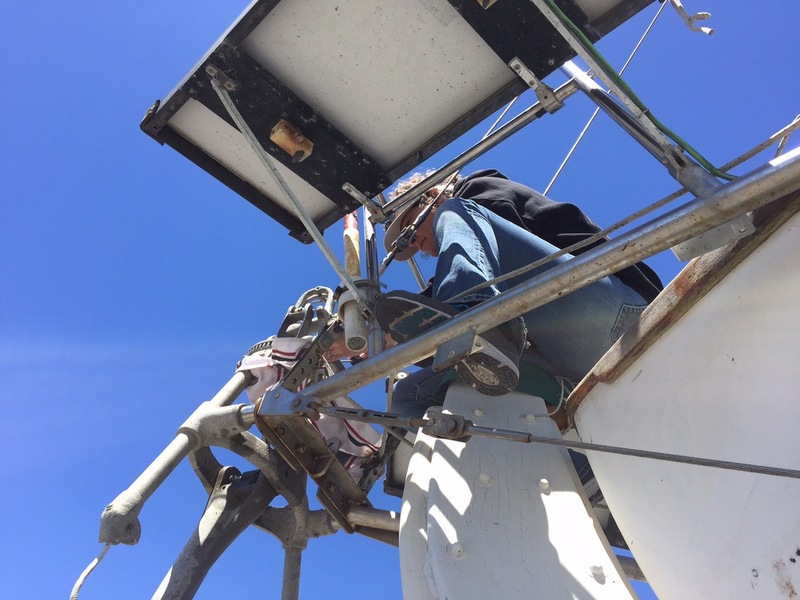 He also took apart, cleaned, and changed the pitch on our feathering prop. I took apart, cleaned and repainted the bilge. Then came the nasty job of getting the Aries windvane to work. This lovely apparatus is much need for our cruising future as it will help steer the boat to course without using any of our precious electricity. And so far we had not been able to get this puppy to budge. It was so corroded that it was locked in place. When we purchased Pablo the Aries was about 90% installed and we were told had been recently rebuilt. In the year and half that we have owned the boat we have not tried to use the windvane or get it to work, which undoubtably made the situation worse. This was a task we knew was going to be difficult and the idea of taking the monster apart while bobbing around in a dinghy was not very appealing. So having the boat on the hard was a great opportunity to tackle this project. At first I tried taking apart and cleaning the accessible pieces while the Aries was still in place. It soon became obvious that we would need to remove it from the boat so that we could safely and easily get to all its parts. 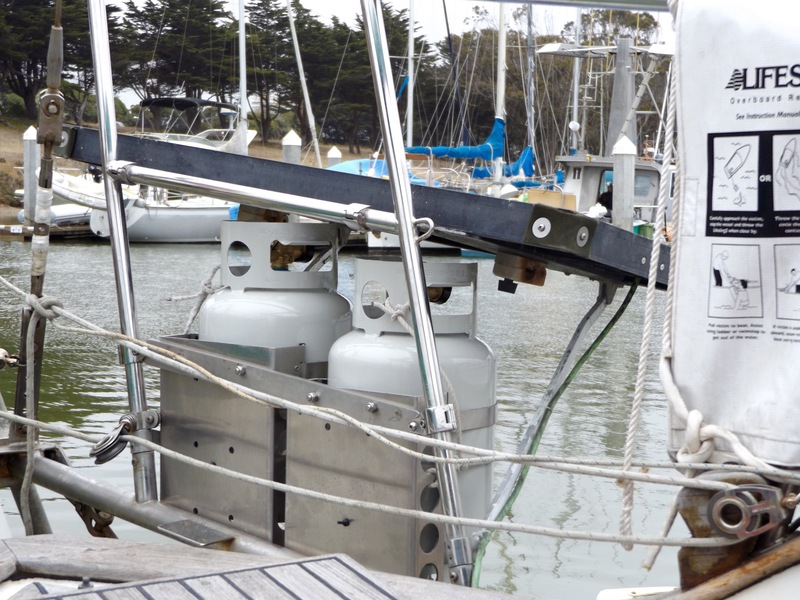 So using a halyard we carefully lowered 70 lbs of corroded metal to the ground. Starting at the top we began the process of dissembling the windvane. Some pieces came off easily, but most of it came off with a bit of wrenching, grunting, and a few swear words mixed in for color. The final pin had to be removed with a hydraulic press. All pieces were cleaned or sanded, and greased or oiled and then resembled. I make it all sound so neat and easy. The truth is this whole process took several days and the unit needed to be reassembled several times due to our errors. In the end we have a complete, working windvane that has been named Viento (Vinny for short), which means wind in Spanish. 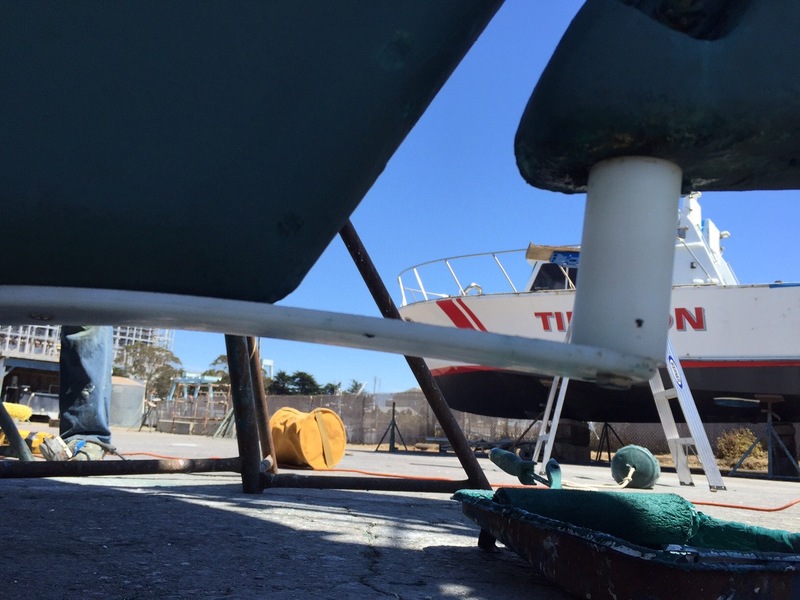 With the remaining time in the yard Steve designed and fashioned a long line/crab pot/kelp deflector for the boat. 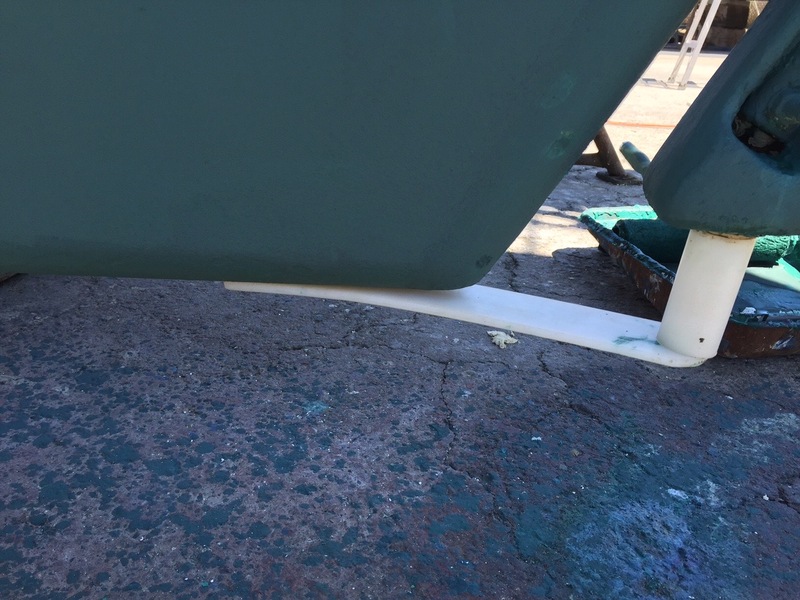 The Westsail, like so many other full keel boats, has a gap between the rudder and the keel which can be a perfect spot for lines to get caught in and cause some real problems. We have talked to quite a few people and read more than a few postings on this subject. We got some help from one of our dock neighbors and buddy Ken Gardner and as you can see from the photos we were able to come up with a good solution. We had a few hours to spare while we waited for the lift to be repaired on our splash day so Steve and I got to work mounting the propane tanks. This was a big bonus because it was so much easier than it would have been trying to keep everything steady while we worked from the dock. We are quite pleased with the location and will get the solenoid valve and lines run in the next week or so. There were a million little things that got completed during this time like making a template for our new V-berth cushions, putting the hailing port on the stern and sewing what Steve is calling our Fender pajamas (covers for the fenders so they don’t get the freshly beautified hull smudgy). We received, countered and accepted an offer on our house and I had oral surgery just to keep things interesting. In the weeks to come we will move from land to boat. We will continue to get our projects done and spend as much time as possible sailing and adjusting to our new reality. I know I should feel tired and perhaps even intimidated by the tasks ahead. But the truth is, when I look at all we have accomplished the work ahead seems like no big deal. 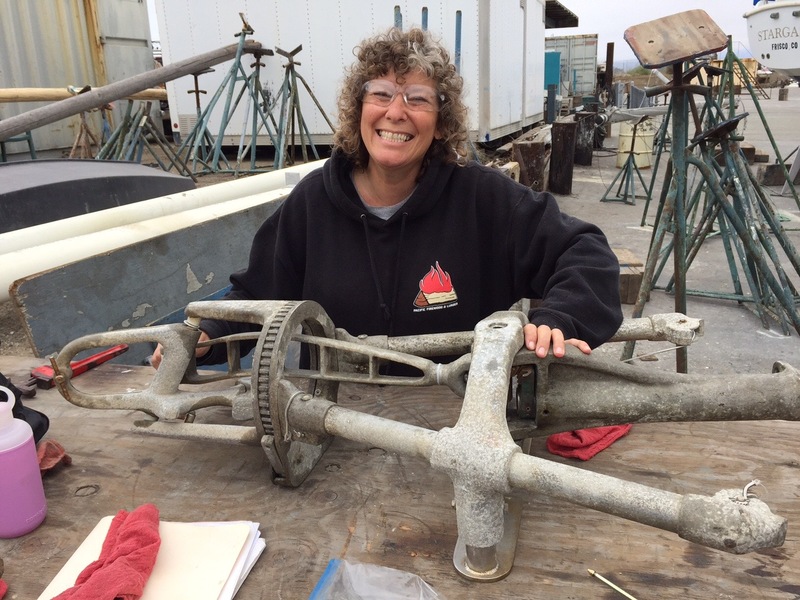 This entry was posted in Uncategorized and tagged Getting ready, Moss Landing, projects. Bookmark the permalink. I am thrilled and excited for you two. How awesome to be living this dream. A dream I have shared for over three decades. Great blog post and good job on all the work. Will you be bringing Pablo back to Santa Cruz? Thanks Steve. We are pretty excited too. Of course at times we are scared out of our wits, but mostly we are thrilled. Will Pablo come back to Santa Cruz? We don’t know. We know that we will return at least for visits, but it’s hard to predict what the future holds. As they say…. Plans are written in sand at low tide. We are mostly just going with flow so to speak. So you are docked in Moss Landing? Yes Steve. 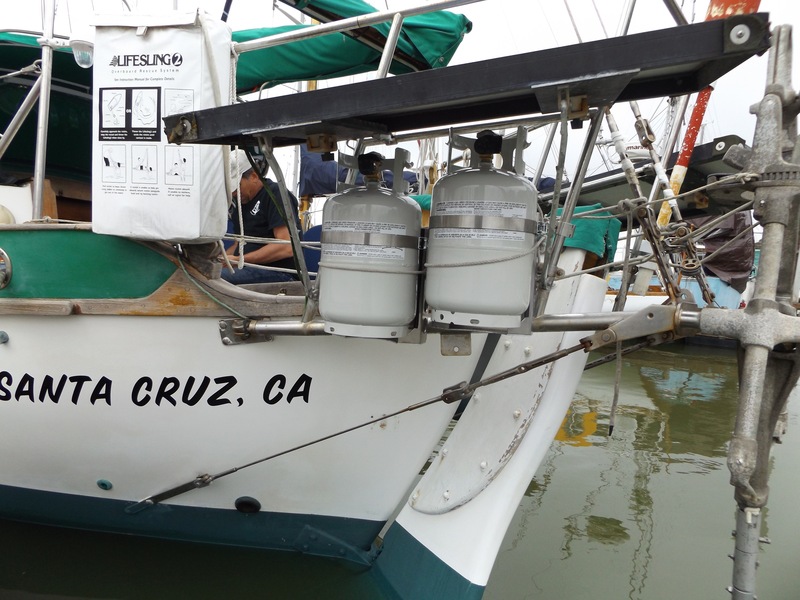 Pablo is currently in Moss Landing and will stay there until we cast off. You and Sherri should come out sailing with us sometime. Absolutely! I’m going to look over your previous blog posts to learn more of your plans. We’re still considering getting one and living in the harbor here for a while. Considering boat payment, slip and liveaboard fees It would actually work out to be less expensive than renting a place. Thanks Doris! I’m glad you found the blog. Things are really moving along quickly now. Once we cast off this site will show our track and position on a global map. If you wish, you can sign up to get an email each time we post something new about our adventures, which hopefully will be more exciting than visits to the boat yard (although that was satisfying in it’s own way).Wishing you joy and happiness!